Is your heart yearning for Africa? For the savannah and the scent of grasses and acacias? For silence and wide horizons? And at the same time you want to enjoy all modern comforts? 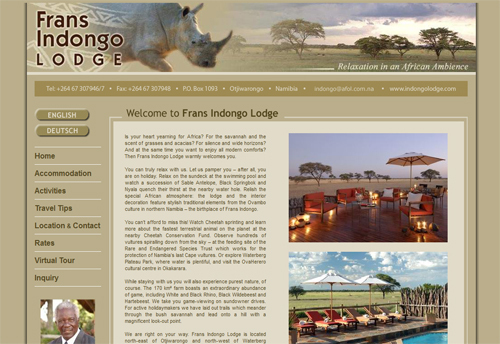 Then Frans Indongo Lodge warmly welcomes you. You can truly relax with us. Let us pamper you – after all, you are on holiday. Relax on the sundeck at the swimming pool and watch a succession of Sable Antelope, Black Springbok and Nyala quench their thirst at the nearby water hole. Relish the special African atmosphere: the lodge and the interior decoration feature stylish traditional elements from the Ovambo culture in northern Namibia – the birthplace of Frans Indongo. 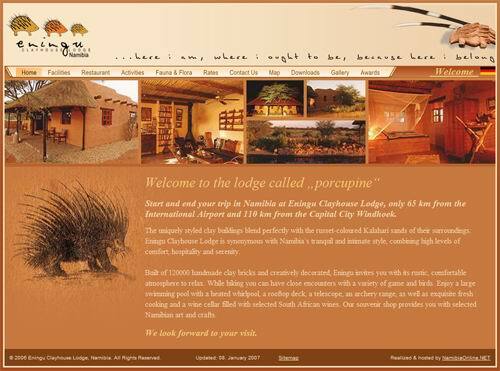 The lodge called "porcupine" Start and end your trip in Namibia at Eningu Clayhouse Lodge, only 65 km from the International Airport and 110 km from the Capital City Windhoek. The uniquely styled clay buildings blend perfectly with the russet-coloured Kalahari sands of their surroundings. 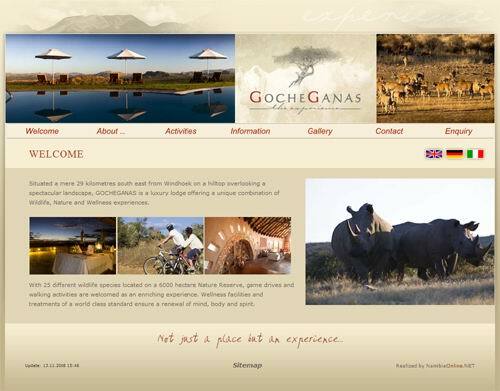 Gocheganas is a luxury lodge offering a unique combination of Wildlife, Nature and Wellness experiences. With 25 different wildlife species located on a 6000 hectare Nature Reserve, game drives and walking activities are welcomed as an enriching experience. Wellness facilities and treatments of a world class standard ensure a renewal of mind, body and spirit. 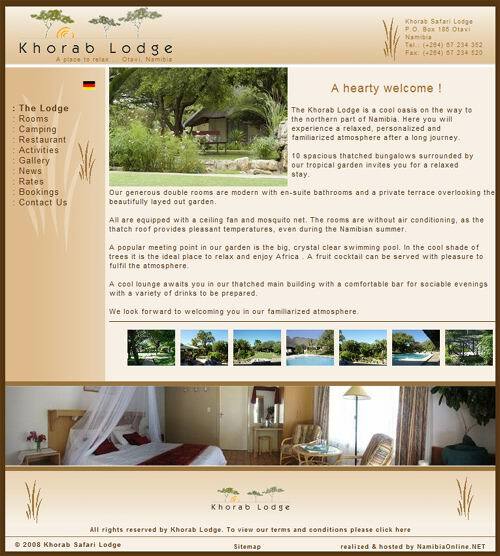 The Khorab Lodge is a cool oasis on the way to the northern part of Namibia. 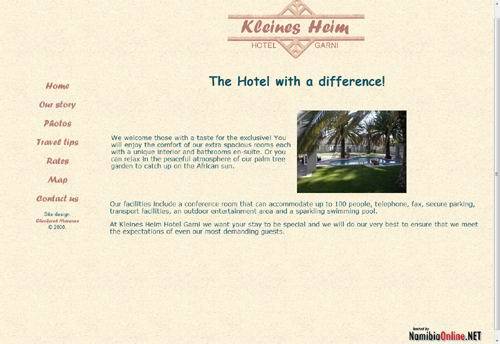 Here you will experience a relaxed, personalized and familiarized atmosphere after a long journey. 10 spacious thatched bungalows surrounded by our tropical garden invites you for a relaxed stay. Our generous double rooms are modern with en-suite bathrooms and a private terrace overlooking the beautifully layed out garden. We welcome those with a taste for the exclusive! You will enjoy the comfort of our extra spacious rooms each with a unique interior and bathrooms en-suite. Or you can relax in the peaceful atmosphere of our palm tree garden to catch up on the African sun. Our facilities include a conference room that can accommodate up to 100 people, telephone, fax, secure parking, transport facilities, an outdoor entertainment area and a sparkling swimming pool. 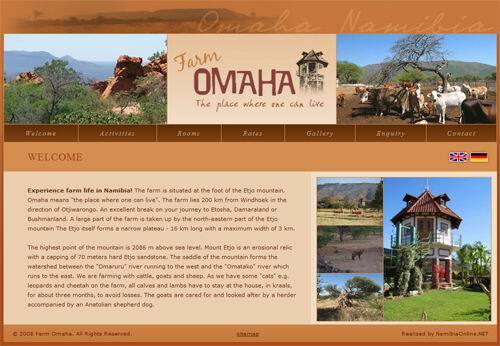 Experience farm life in Namibia! The farm is situated at the foot of the Etjo mountain. Omaha means "the place where one can live". 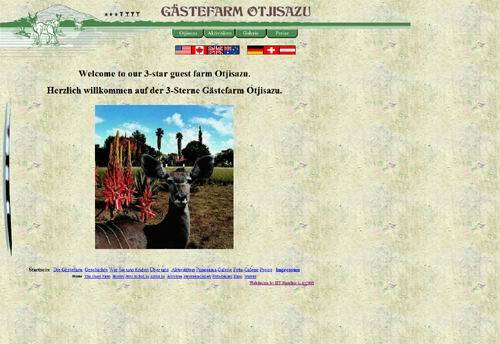 The farm lies 200 km from Windhoek in the direction of Otjiwarongo. 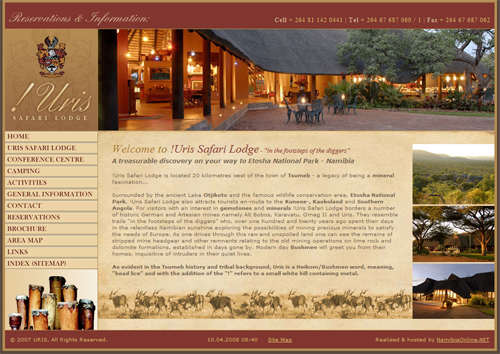 An excellent break on your journey to Etosha, Damaraland or Bushmanland. A large part of the farm is taken up by the north-eastern part of the Etjo mountain The Etjo itself forms a narrow plateau - 16 km long with a maximum width of 3 km. Farm house and guest rooms are tucked away in the colourful garden with various cacti and exotic plants. Otjisazu offers 16 comfortable rooms with private facilities (shower and toilet). All rooms are well equipped according to European standard. During the African summer, life is enjoyed outside. All meals are served on the Lapa, the thatched-roof restaurant. During the short African winter, the same service is offered at our cosy bar inside. 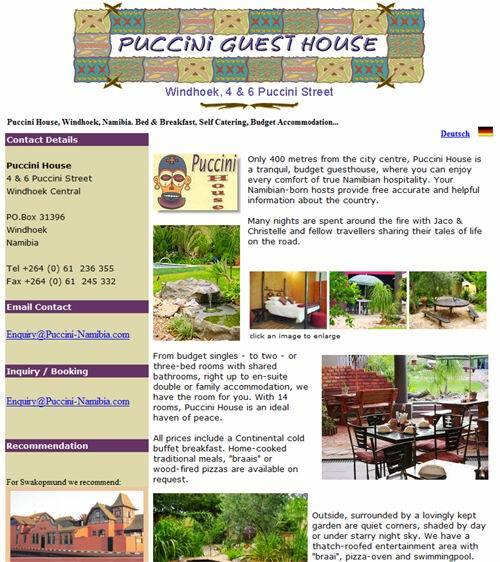 Only 400 metres from the city centre, Puccini House is a tranquil, budget guesthouse, where you can enjoy every comfort of true Namibian hospitality. Your Namibian-born hosts provide free accurate and helpful information about the country. Many nights are spent around the fire with Jaco & Christelle and fellow travellers sharing their tales of life on the road. Surrounded by the ancient Lake Otjikoto and the famous wildlife conservation area, Etosha National Park, !Uris Safari Lodge also attracts tourists en-route to the Kunene-, Kaokoland and Southern Angola. For visitors with an interest in gemstones and minerals !Uris Safari Lodge borders a number of historic German and Artesian mines namely Alt Bobos, Karavatu, Omeg II and Uris.